Top U.S. ag negotiator confident that industry will be supportive of TPP in the end. 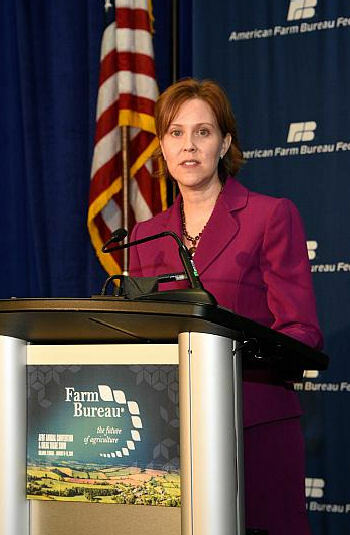 With agricultural prices on the slide, trade is more critical than ever and an important part of the U.S. safety net, Ambassador Darci Vetter, chief agricultural negotiator for the Office of the U.S. Trade Representative, said. During a press conference on the sidelines of the American Farm Bureau Federation's annual convention, Vetter noted that if U.S. farmers can't maintain and grow export markets, it increases their costs as well as the risks of doing business. Vetter focused mainly on the Trans-Pacific Partnership (TPP), which was finalized in the fall but awaits ratification by Congress and the President. U.S. agriculture already has deep roots in the TPP negotiating area, with 42% of U.S. agriculture products being shipped to the participating countries. Vetter contended that this region will only continue to grow in importance. The key to gaining a competitive foothold is to reduce or eliminate tariffs. When asked what is at stake if the U.S. waits to approve the TPP measure until after the November elections or possibly into 2017, Vetter said the U.S. will not get the preferential access the member countries agreed to until everyone crosses the finish line. While TPP was being negotiated, other countries formed their own preferential trade agreements with each other and the European Union, which puts the U.S. at a continued disadvantage, especially with Australia for beef exports to Japan and New Zealand dairy exports. Reports surfaced of dampened support for the trade deal from the National Pork Producers Council — initially one of the staunchest supporters of TPP — after lawmakers in Japan presented draft subsidies to cover up to 90% of losses accrued between production costs and the sales price. This represents a 10% increase from the current support plan. Meanwhile, the dairy industry has yet to conclude where it stands on the final TPP package, and the rice industry may oppose the final deal. Vetter said the overall “support from agriculture is quite strong,” and she especially expects continued strong support from the meat industry. Even though the dairy industry hasn't come out in favor of the deal, it has issued statements supporting the sanitary and phytosanitary measures as well as geographic indicator protections that prevent protection of overly broad cheese names, she noted. In addition, having every product on the table in TPP without exception “creates a powerful example for other countries who want to join,” which should allow industries like dairy and rice to take comfort in knowing that those standards are in place for future TPP member countries.